Much of what we know about secrecy jurisdictions has come into the public domain thanks to the work of whistleblowers. Sometimes these people are motivated by money, but more often than not they are people of integrity who find it impossible to align their personal values with those of their employer. This is the case with Ron Edelweiss, a Swiss banker turned whistleblower after working on the fictitious Caribbean secrecy jurisdiction of Crocodile Island. Having worked for nine years at the heart of an apparently respectable Swiss bank, Edelweiss walks out on an organisation which he regards as corrupt to its core. Based on a true story, this book claims to provide unique and astonishing insights into the closed world of offshore banking. It also reveals a truth not widely understood: for all the fine words spoken about the importance of whistleblowers in protecting public interest, too little is done to protect them from the thugs whose interests they challenge. They can expect to be bullied, harassed, belittled and hung out to dry. 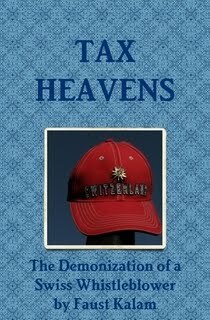 We hope to review Tax Heavens in due course.